The Lazar Enzo Accent Chair features beautifully crafted wood arms. The keynote of the design, the arms crown the top of the arm rest and continue sweeping to the back of the chair, becoming the back legs. The effect is a dramatic floating appearance. The front wood legs are tapered cone shape, adding to the look of the arms as they gradually taper from front to back. The chair is designed to casually lounge in, and it's perfect for doing so thanks to the very thick and plush seat and back cushioning. There are many fabric choices available for the Enzo. Please see more details below, making sure to click on the various tabs to see fabric choices. At Foster's we love helping in the design process. Please feel free to give us a call if you'd like to get ideas for fabric selections or with any questions you may have about this design. 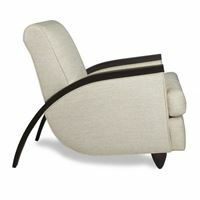 There are many fabrics Lazar has available to use for the ENZO ACCENT CHAIR. Please click the LAZAR FABRICS tab above. If you want us to help guide you with picking out a fabric, please give us a call and we can help in the selection and design process as much as you'd like us to. We love being creative! Frame Lazar frames are made from solid kiln dried hardwood lumber and from furniture grade ¾”, 7 ply or better, cross grained domestically sourced hardwood plywood. Frame parts are assembled by interlocking components which are then glued and stapled at all contact points. Plywood is CARB compliant and bears a Forrest Stewardship Council certification. Suspension Our products utilize different suspension methods depending on the style. This design utilizes high resiliency rubberized webbing and sinuous loop carbon steel springs. In this design, carbon steel springs provide seat suspension, and rubberized webbing provides back rest suspension. Please ask us if you'd like more indepth details on the suspension systems of this design. Cushions Standard seat cushions use CertiPUR-US® certified foam consisting of 2.0lb High Resiliency (HR) flexible polyurethane foam. Cushion cores include a foam crown patch top and bottom to provide long lasting shape. Cushions are encased in a non-woven fabric bag with zippered closure. Cushions should be flipped and rotated regularly to ensure even wear and longevity. The things you put into your home can have an impact on your health. Make sure the products you decide to buy are made by factories that care about you, your health, and your enjoyment of the things they make. The Elliot Accent Chair by Elite Modern is a classic mid-century design, enhanced by ergonomic comfort and clean sculpted form. 29"D x 28"W x 30"H.
The Senna Accent Chair by Elite Modern is a classic design, featuring curvy sloped arms and a mid height back which makes this design very comfortable to sit and enjoy time in. 28"D x 27"W x 32"H. See details below for all finish and cover options. Be sure to consider a complimenting accent table. We've selected some possibilities to take a look at the bottom of the page. 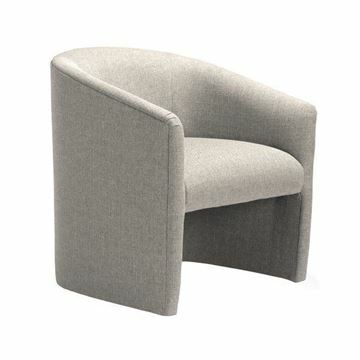 The Baci Swivel Chair by Lazar. 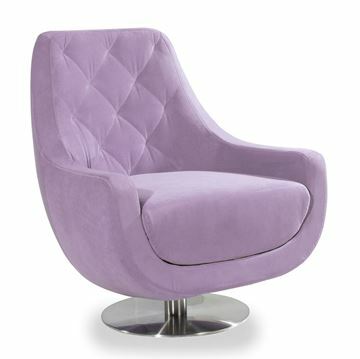 A comfortable high back chair, wonderfully shaped to give you great seating comfort with style. 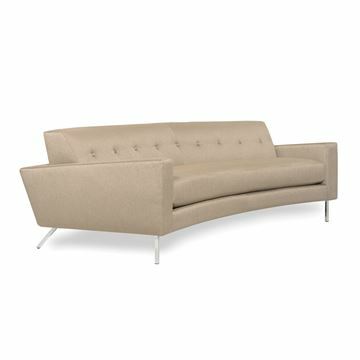 Available with a brushed steel base, or with four solid wood legs that slightly flare out. There are several finishes for the wood legs, and many fabric choices. Please see more details below, and be sure to click on the tabs to see fabric choices, and wood finishes. At Foster's we love helping in the design process. Please feel to give us a call if you'd like to get ideas for fabric selections or with any questions you may have. The Classic Accent Barrel Chair by Lazar. The Classic Accent is a stylish and utilitarian design, featuring a very comfortable seat cushion and ergonomically embracing rounded back. It can be used as an accent chair, a dining chair, or game chair. Customers continually comment at the comfort this chair provides. The chair comes standard with low profile invisible glides, but casters can be added for additional ease of use around dining or game tables. There are many fabric choices. Please see more details below. Please be sure to click on the various tabs to see fabric choices. At Foster's we love helping in the design process. Please feel free to give us a call if you'd like to get ideas for fabric selections or with any questions you may have about this design. 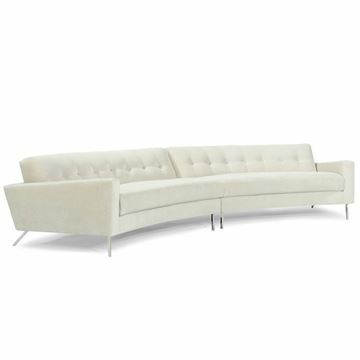 The Flamingo Sectional by Lazar. Graceful curves and a very unique back cushion are hilights to this beautiful design. The overall look is well balanced with straightforward slim arms, giving a balanced and refined look. We really love how the front polished steel legs align with the front arms, and the back legs extend just past the frame. The Flamingo Sofa by Lazar. Graceful curves and a very unique back cushion are hilights to this beautiful design. The overall look is well balanced with straightforward slim arms, giving a balanced and refined look. We really love how the front polished steel legs align with the front arms, and the back legs extend just past the frame.